Wisconsin Governor Scott Walker, speaking Thursday at the Conservative Political Action Conference (CPAC), an ultra-right political conference held in suburban Washington DC, compared the working class and student protesters who thronged the streets of Madison in 2011 to ISIS terrorists. “If I could take on 100,000 protestors, I could do the same across the world,” he said, boasting that his defeat of the unions in Wisconsin qualified him to wage war in the Middle East. No one at CPAC was fooled by the subsequent disclaimers. On the contrary, Walker’s remarks, including his comparison of protesters to ISIS, were greeted with noisy cheering, and his speech was the most well-attended of the day’s events. Walker is a top-tier candidate for the Republican presidential nomination, leading in party polls in Iowa, the first state primary contest, and well financed by billionaire supporters like the Koch brothers. The clear favorite among the half dozen potential presidential candidates who addressed CPAC, Walker repeatedly cited his success in pushing through a battery of anti-worker laws in Wisconsin as his political calling card. 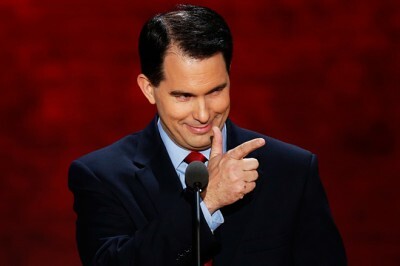 When a heckler shouted something about his attacks on workers, Walker received a standing ovation from the crowd as he claimed to represent “the hard-working taxpayers of this country.” He provoked another ovation by announcing he would sign a right-to-work law next week, making Wisconsin the 25th state to outlaw the union shop. Walker’s “gaffe,” if it was one, was the blurting out of a usually unspoken truth: in the eyes of the American ruling elite, the working class at home is an enemy just as dangerous—and in reality, far more dangerous—than Islamic fundamentalist terrorists in Iraq and Syria. The Wisconsin governor is not the first prominent figure in the US ruling elite to make such a comparison. Only a month ago, New York City Police Commissioner William Bratton—appointed by liberal Democratic Mayor Bill de Blasio—announced plans for a Special Response Unit of 350 highly trained paramilitary police. This new unit was “designed for dealing with events like our recent protests or incidents like Mumbai or what just happened in Paris,” Bratton said, equating peaceful marches against the official whitewash of police murders in New York City to the terrorist attack on Charlie Hebdo magazine that killed 10 people and the massacre of nearly 200 people in Mumbai. (See: New police unit in New York: The ruling elite prepares for class struggle). Like Walker, Bratton sought to defuse outrage, saying he had misspoken and that there would be two separate elite police units, one to kill terrorists, the other to beat and arrest demonstrators. In making an amalgam of peaceful protest and terrorism, to justify murderous mass repression, American politicians are following in the footsteps of military juntas and right-wing dictators around the world.